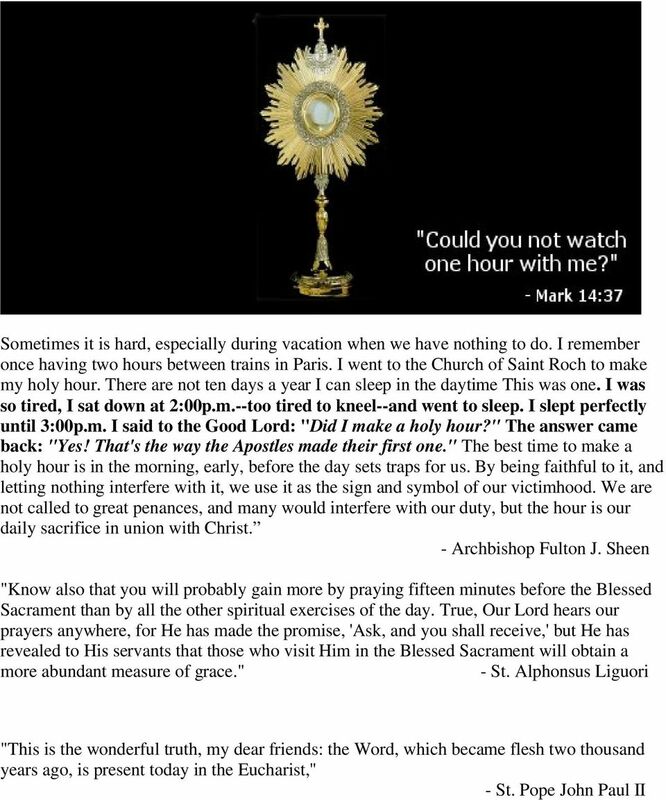 Download "Why do we go to Adoration? 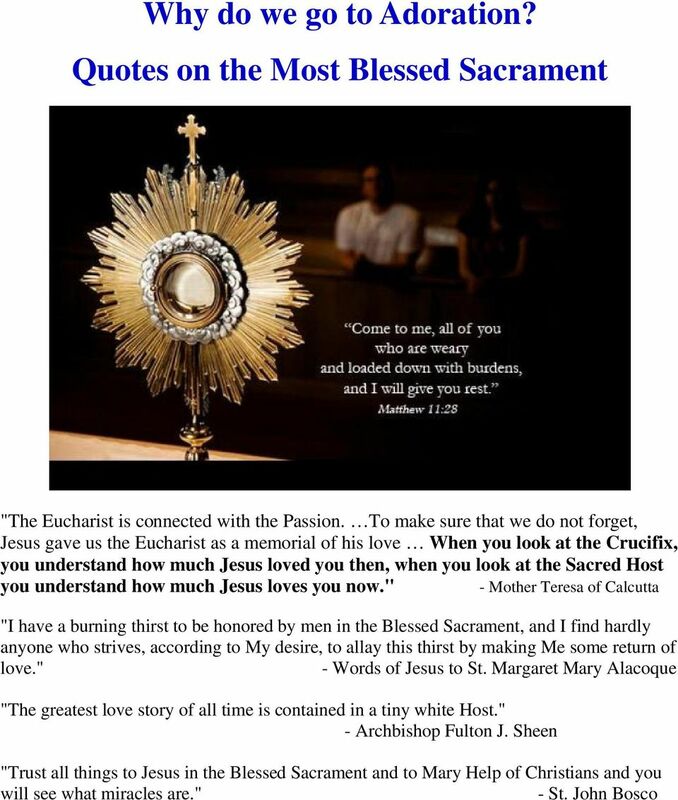 Quotes on the Most Blessed Sacrament"
92 Questions 1. How many Gods are there? A. One. 2. How many Persons are there in God? A. 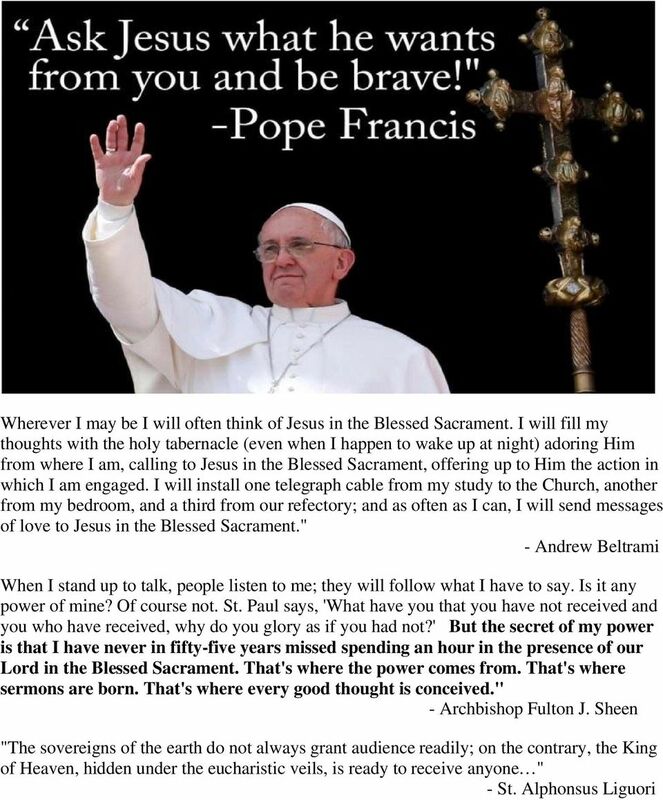 Three persons in God. 3. Who are they? What are their names? A. God the Father, God the Son, and God the Holy Spirit. The first mystery of the Last Supper. Jesus washes the feet of his apostles. We pray for the Christian spirit of service in leadership. 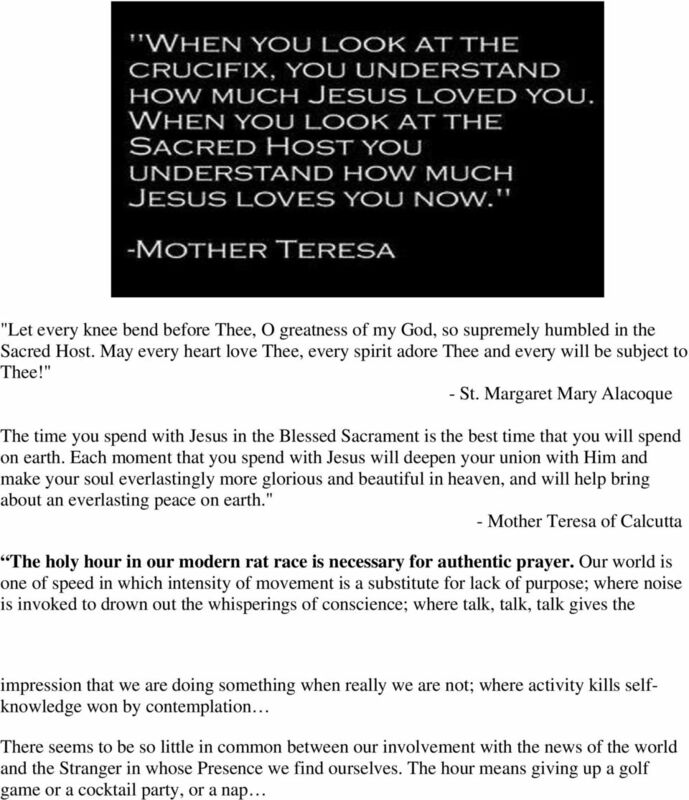 BASIC CATHOLIC PRAYERS Sign of the Cross In the name of the Father, and of the Son, and of the Holy Spirit. Amen. 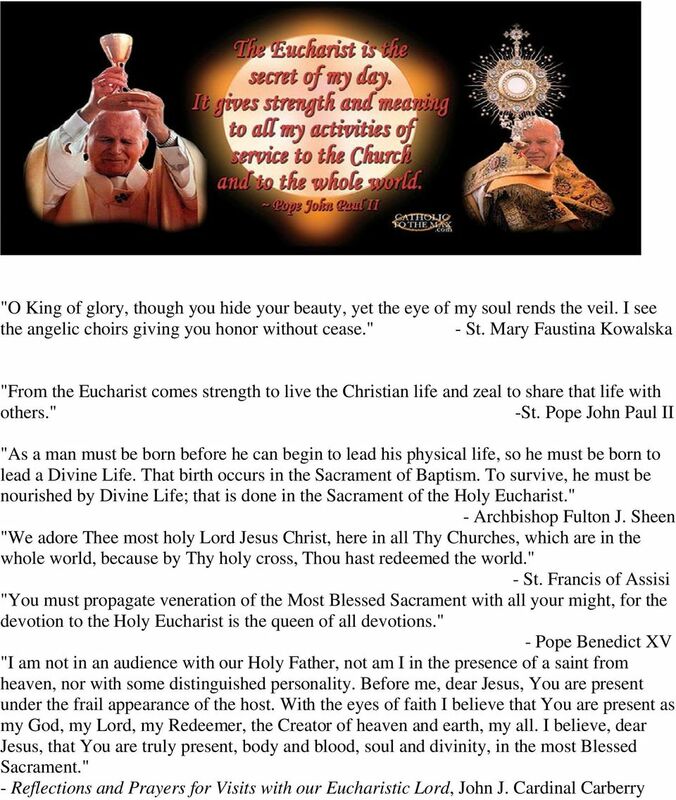 The Apostles Creed I believe in God, the Father almighty, creator of heaven and earth. 7.1.1 The church is Christ together with his people called both to worship and to serve him in all of life. PRAYER OF THE FAITHFUL Solemnity of Epiphany January 5/6, Lord, hear our prayer. The Sign of the Cross In the Name of the Father, and of the Son, and of the Holy Spirit. Amen. Condensed Version THE DISCIPLESHIP EVANGELISM COURSE 48-lessons by Don W. Krow with Andrew Wommack Unless otherwise indicated, all Scripture quotations are taken from the King James Version of the Bible. Draft 2007. 27762 County Road 27 Sleepy Eye, MN 56085. For Private Use Only! Order of Service for Holy Communion or Eucharist The Invocation The candles either side of the cross on the altar are lit as the celebrant says Celebrant: Let us build Gods temple in prayer and in praise. The first mystery of the Church. Jesus calls all men to be his disciples. We pray for all the missionary work of the Church. Knowing Him Lessons from Paul s Life and Ministry Lesson 8 Ephesians 1 Our Place in God s Plan Has there ever been a time when you ve wondered about the meaning of life and why you were put on this earth? 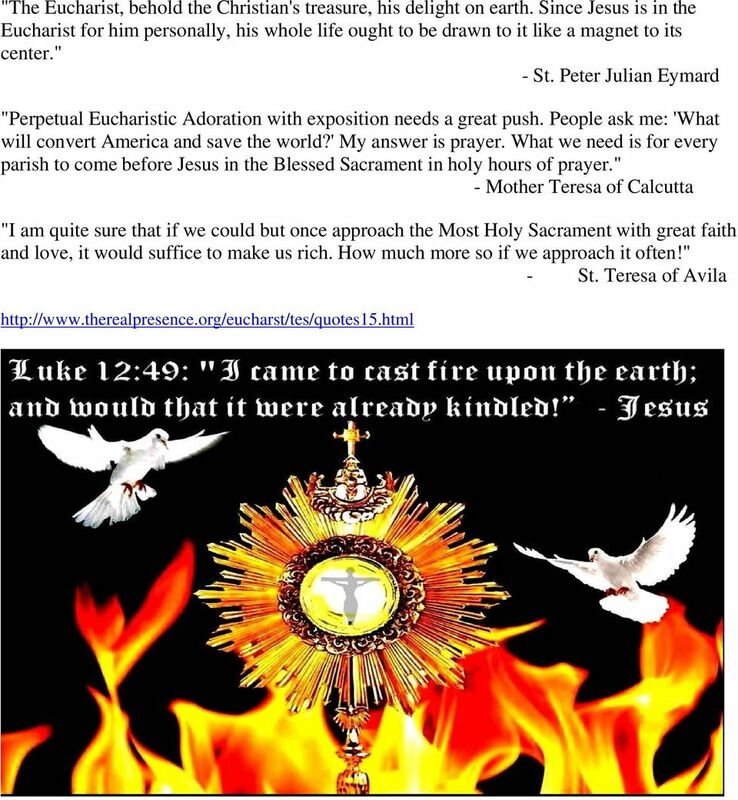 For more information on this study guide/pamphlet go to : www.someonecaresministry.org. LIVING OUR LASALLIAN HERITAGE: BECOMING PEOPLE of PRAYER. Lift up your hearts to the Lord and give Him thanks. 5. It was only because man was selfish that Jesus would later add, What God has joined together, let not man separate" (Matt 19:6). BLESSING OF A HEADSTONE ORDER OF BLESSING. The grace of our Lord Jesus Christ, giver of life and conqueror of death, be with you all. Penitential Service Opening Prayer Almighty and Mercy-full God, you have brought us together in the name of your son to receive your mercy and grace in a time of need. Open our eyes to see our sinfulness. Lesson 2 Opening Thoughts on Who Is the Holy Spirit And How Does He Work? Notice the heading: «A Song of degrees for Solomon.> This was most likely a song of David for his son, Solomon.